CCE is a portable application which does not require installation. You can even run it directly from removable media such as a USB key. In normal mode, CCE scans your computer for malware, viruses and rootkits without terminating any currently running processes. In aggressive mode, CCE terminates all existing processes running under explorer (and explorer itself) so it can perform a deep system scan. Warning: Make sure you have saved everything you need before you run CCE in this mode. Aggressive mode will close all running applications, and will close this help page too. Killing explorer leaves you at least temporarily without a desktop and start menu. If required, you can manually start explorer by pressing the Windows start button + 'R' then typing 'explorer.exe' in the 'Open' text box. Please note that starting explorer.exe may restart viruses if they are registered as explorer autoruns. You can check this with the 'Autoruns' tool. 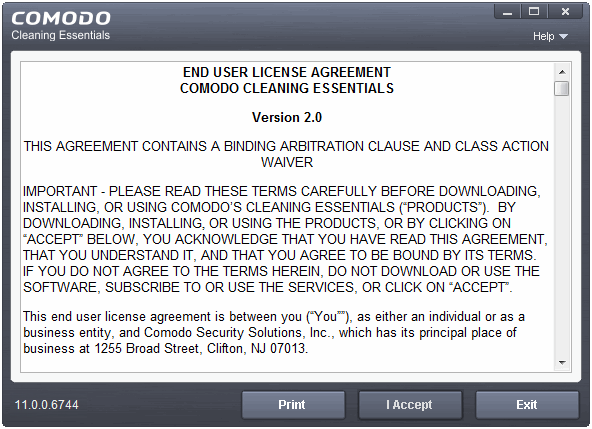 Read the agreement and click 'Accept'. If you do not want to use the application, click 'Exit'.